Walking tracks in some of our favourite parks are easier to navigate thanks to Thomas Schmid’s business, which is better able to manage its important work after seeing the Small Business Mentoring Service. While Thomas already had a thriving business building and maintaining park walking tracks and trails, he wanted to improve his administration and organisation. A former ranger with the Tasmanian Parks & Wildlife Service, he started Track & Trail Management Services in 2001. It averages six employees, which increases during peak seasons. “I had a background in managing walking tracks in Tasmanian national parks and saw the opportunity to undertake similar work as a contractor for national parks in other States around Australia,” Thomas says. The business is now based in Victoria and works regionally in Victoria, Queensland, NSW and Tasmania. 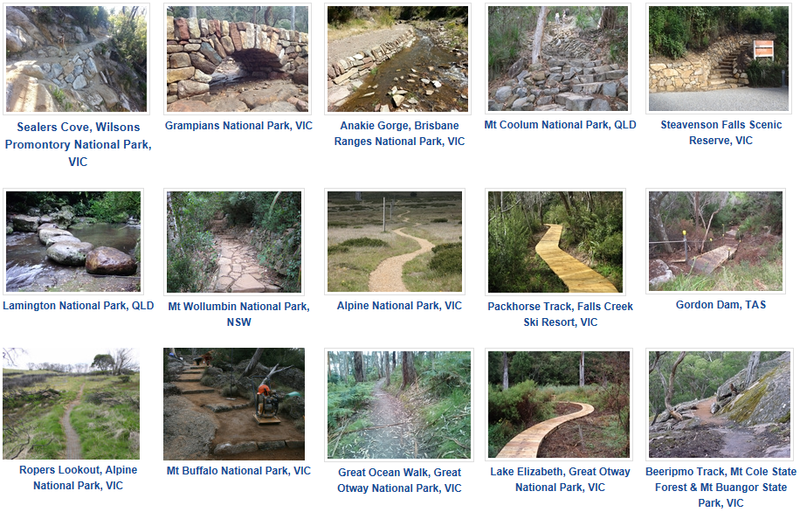 Parks it has enhanced include the Grampians National Park, Steavenson Falls near Marysville and Gordon Dam in Tasmania. TTMS has worked as far north as Magnetic Island in far north Queensland. The company builds tracks and trails that are sustainable and flow through the landscape, enhancing the natural setting. This is achieved by using mostly local materials such as local rock, or boardwalks and bridges which curve with natural lines. Customers include national park and wildlife services such as Parks Victoria and its NSW and Queensland counterparts as well as state environment and primary industries departments. TTMS provides extensive experience and very skilled staff, having completed many projects. When business picked up in 2008-2009, Thomas moved from being a sole trader to a company. Hoping to consolidate and do things better, Thomas discovered SBMS after approaching Small Business Victoria. He attended an SBV workshop that included an SBMS voucher. Thomas was matched with mentor Bruce Abbott, who has more than 30 years’ experience in the steel, manufacturing and distribution industries. After starting as a metallurgist with Comsteel, Bruce became marketing manager and moved to BHP, where he rose to Group Manager Marketing. He then spent 15 years in executive recruitment with Boyden Melbourne. Thomas had three sessions over 10 months and mentoring is continuing. Bruce covered many aspects of business and marketing including market segments, costing and accounting, office options, staffing and position descriptions, pricing and terms, marketing and branding options, brochures and capability statement, time management, sales and general management. “Thomas has picked up business nouse as he grew the business, however it has grown to a size that he needed to take a more systematic approach,” Bruce says. As a result of the mentoring, Thomas produced a capability study outlining his business and what it offers. He also “bit the bullet” and rented a large warehouse to better store his tools and other equipment. Bruce says their sessions reassured Thomas about what he was doing right and identified areas for improvement. Bruce says Thomas has improved his understanding of running a business and what is required to run it efficiently. “Our next focus will be on further implementation of marketing and sales efforts; also better and more online systems,” Bruce says. Since seeing Bruce, Thomas is more organised and better able to manage the seasonal nature of his business. He did not necessarily want to expand as he wants to maintain his quality of life. TTMS also uses cloud technology, in its case Google documents, to keep track of timesheets and project expenses due to its work in many different locations. Thomas and his colleagues, who travel a lot, can now spend as much time as possible doing what they love best – planning, building, maintaining and improving walking paths and trails.